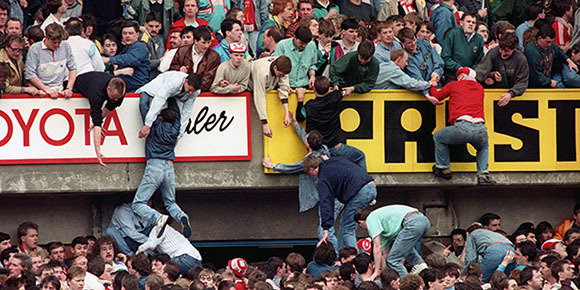 Ninety-six men, women and children were killed in a crush at Hillsborough football ground on 15 April 1989. Many more were left injured, traumatised and grieving. The first inquest into the tragedy reached a verdict of accidental death. The disaster was blamed on the Liverpool fans’ behaviour – they were painted as drunken hooligans. But the families of those who were killed refused to accept this version of events. For years, they campaigned to clear their loved ones’ names. Once a second inquest was announced in 2012, the Hillsborough families used the Human Rights Act – which protects ordinary people’s right to life – to ensure the inquest had the power and scope to uncover the truth. The jury concluded that those who lost their lives at Hillsborough were unlawfully killed, and that mistakes made by the police, ambulance services and those who designed and managed the stadium had contributed to their deaths. Crucially, it also found that the fans were not to blame for the disaster. Barry Devonside, Becky Shah and Steve Kelly all lost loved ones at Hillsborough. They speak about what happened to their family members, and how the Human Rights Act helped them expose the truth. Barry’s son Chris was just 18 when he died at Hillsborough. He was with ten friends at the match and three of them were killed. Barry was at Hillsborough that day too. He and Chris travelled to the game together, but had tickets in different stands. As the tragedy played out, Barry knew Chris was somewhere in the crush of people, but was powerless to help him. Barry remembers Chris as a thoughtful, sociable young man who loved to laugh. He and his wife Jackie have devoted much of their lives life to pursuing justice for their son. Barry attended every day of the recent two-year inquest. Becky remembers her mum, Inger, as a bubbly, intelligent and caring person. Inger loved football and always stood at the front at matches because she was so small. She died with her friend Marian McCabe at the front of the pens. After Inger’s death, Becky and her brother were taken into care. Traumatised, in shock, and still being questioned by the police, they struggled to cope. Today, Becky is still heavily affected by the trauma of Hillsborough and the events that followed. She continues to fight hard for justice. Steve’s brother Michael was an experienced football supporter, when he died at Hillsborough the shock was huge. At first, Steve was told that all the bodies had been identified so his brother could not be among the dead. But when he didn’t hear from Michael, he went to the stadium. He was told there was one man still yet to be named and shown a photo – it was Michael. Steve remembers the shock of realising that the quiet family man who had always looked out for him was no longer there. Steve has campaigned for justice for the 96 for many years, and offers his skills as a volunteer counsellor.